First, a refresher. The Forerunner 910XT was a triathlon watch. It had some killer features, like the ability to monitor not only your outdoor swims via GPS, but also your indoor swims using its built in accelerometers. It could also tell you how many strokes you took for each lap and even what type of stroke it was. So if you switched from freestyle to breaststroke, it knew. It was also easily mountable on your bike handlebars, and of course, you could use it for running. The new 920XT includes all of that stuff, but adds a lot more. For starters, there's a lovely, color screen which will help you separate the different data fields you're looking at. It's essentially e-ink, so it can remain on, in watch mode, for extended periods of time. GPS tracking times have been increased to a full 24 hours, and if you're an (insane) ultra-runner, you can put it in UltraTrac Mode to get up to 40 hours. For all that, 15 percent lighter and 18 percent thinner than the 910XT, which is a good thing because, to be honest, that thing was kind of chubby. What's totally new is that it now acts as an activity monitor, too. Think Garmin's Vivofit, or its upcoming Vivosmart, but included in the watch. This should give you a more holistic view of your health and provide you with more accurate recovery times in between your workouts. Its features include steps, distance, calories, countdown to a daily goal, an audible "move alert" after an hour of inactivity, and sleep tracking. It also apes smartwatches and will display notifications of incoming text, call, email, and calendar reminders, as long as it's paired with your smartphone via Bluetooth. How well will it do that? Probably not very, but hey, one never knows. It's gotten better for during workouts, too. While swimming it will still track your distance, pace, stroke type, stroke count, and SWOLF score, but now it adds rest timers to crack the whip on you during your drills, and it has distance alerts to let you know when a set is over. As someone who constantly loses track of how many laps they've swam, that is a killer feature. It will also give you time alerts to help you hold your pace. On the bike, in addition to giving you the standard speed, distance, and duration, it can display a whole wealth of other data if you pair it with compatible sensors for cadence, heart rate, and power. With certain ANT+ power meters (Vector S and the dual-sensing Vector system) you can view your average watts and your left/right balance. Add an HRM and you can see your estimated VO2 Max for cycling, too. During your run, the 920XT has poached some of the Advanced Running Dynamics features from Garmin's flagship running watches (such as the Forerunner 610). In addition to the pace/distances/time/speed that you'd expect, if you pair it with Garmin's HRM-Run heart rate monitor you also get cadence (steps per minute), vertical oscillation (how much bounce you have as you run), ground contact time (how much time your foot spends on the ground each step), a recovery advisor, and a race time predictor. 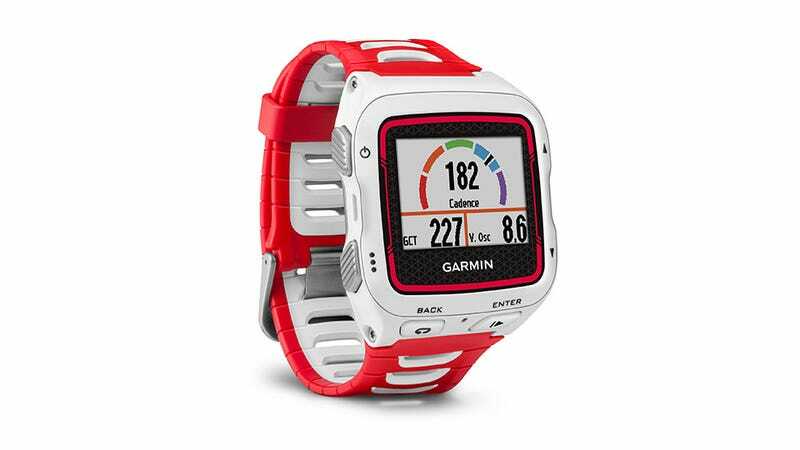 It even has a metronome with vibration and audible alerts to help you keep your cadence on track.